Time is everything. Let’s get going! I’m going back to the hospital for scans today, and then will see my doctor tomorrow. These visits come up every three weeks (scans every 6), since I’m part of a clinical trial. Mostly I don’t mind the frequent visits, but traveling 3.5 hours each way so often gets kind of old. It’s hard to say exactly how I feel when it comes to scan weeks. It makes me nervous, but I also know there is nothing I can do about the results. It is what it is. Treatment is going well – so I’m still on the drug that I started at the end of January, Lorlatinib. 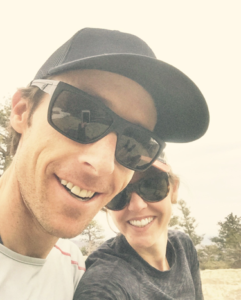 Funny story – I took Crizotinib half-way through a backcountry marathon a while back and thought I was going to lose the contents of my stomach – it was terrible. I took my Lorlatinib pill 8 miles into 14 and felt perfectly fine. Go figure…drugs and science are crazy! I feel good, though. I pre-ran the Aspen Backcountry Half-marathon a few weeks ago, rode my mountain bike for 34 miles and went for a 15-mile hike up to a high mountain pass in Glacier National Park. I continue to run and even got signed-up for the Minneapolis Marathon in October. Really, things are pretty good! 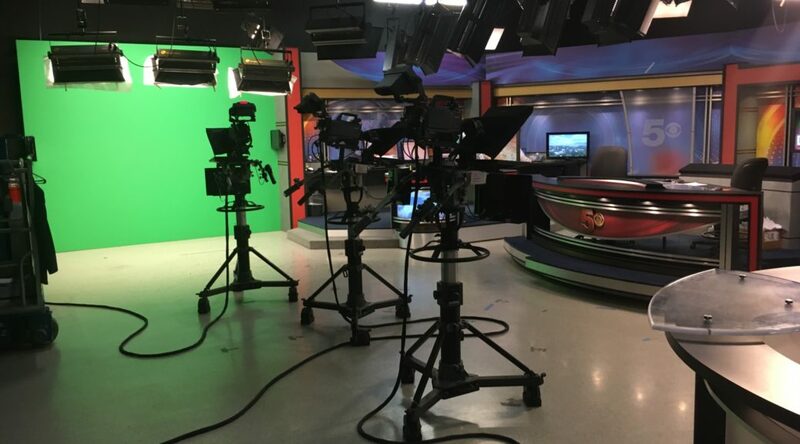 This week, I had the privilege to sit in front of cameras and share how a Western Slope hospital in Colorado has decided to take the first step toward “Keeping it 100.” So what does that mean? At my former practice, this meant ensuring every patient with a pulmonary nodule was followed according to guidelines. What that means for this hospital is the ability to now optimize the management and care for all pulmonary nodule and lung cancer patients. It’s crazy to think that up to 1.5 million people in the United States are diagnosed with lung nodules each year. Let me tell you what this means. 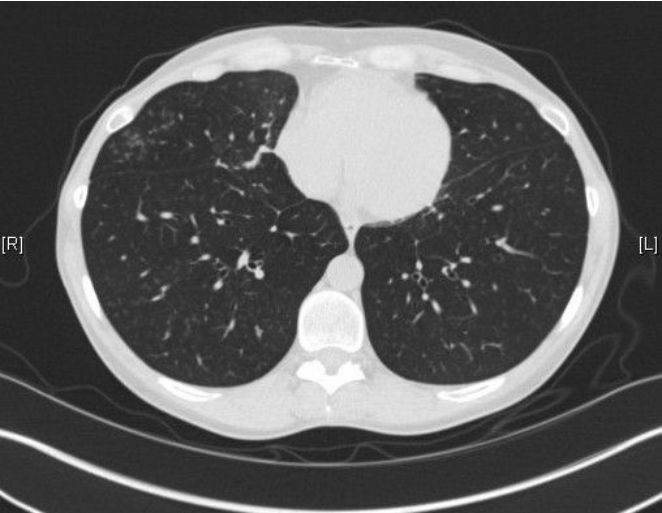 Recent attention to the importance of evidence-based medicine has contributed to established treatment guidelines for pulmonary nodule management. Guideline disconcordance means something other than what the guidelines suggest for treatment or diagnosis is done. Multiple studies have shown that up to 70% of lung nodules are treated outside the recommendations. Let’s think about that for a minute….and I want to illustrate how crazy this is with a couple examples. This would be the same as if you had heart failure and were given a medication outside of the recommendation 70% of the time. Could you imagine the outrage if you had an abnormal mammography, and the next step was outside of the recommendations 70% of the time? Or how about something as simple as antibiotic use – what if the wrong antibiotic was given 70% of the time? I could go on and on about how big this problem is, and solving it will be a step by step process. My contribution is technology to ease the burden of doing what’s best for patients with lung nodules, and the complexities that make it difficult for those of us trying . I hope I am one of the people responsible for sea change. “Keeping it 100,” that’s the goal. Let’s figure it out together. American Thoracic Society and Bay to Breakers! 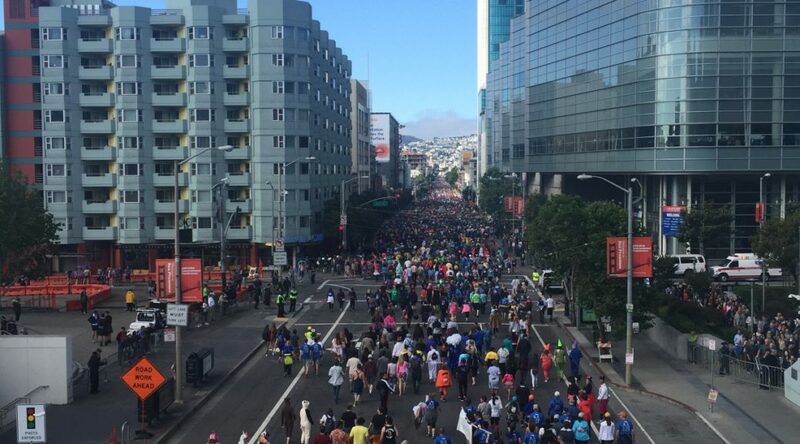 I just returned from this year’s American Thoracic Society meeting in San Francisco and it happened to coincide with the Bay to Breakers race (more on that later…!). I met up with some of the best minds in the Interventional Pulmonary field and I feel truly blessed to be included in this group. I was able to participate in very fruitful discussions, as well as compete in a competition with a group of individuals that I have looked up to for years, and continue to look up to. I will never forget this year’s ATS. I am a neophyte in my clinical career as an Interventional Pulmonologist, and entered into the field in a non traditional way. I am not discounting all of the hard work I have done, but honestly, I still pinch myself when I am around this group of talented men and women. I was able to talk to many doctors and nurses about The Nodule Project and LungDirect – thanks to all of you that spent time to check out what we are working on. Item 1, check! At the top right of this page, it says “Time is everything, Let’s get going.” With that in mind, collective potential is the motivation for item two. How do we get more people managing nodules more appropriately, and faster. The answer is coming together with like minded people and solving the problem together. Three guys who have been in the nodule management game for the past 15 years have expended much political and personal capital for the cause and my many thanks go out to Jon, Eric and Chet. Truly wonderful people who I am blessed to call friends. Can’t forget to thank Jackson too. Item 2, check! I was invited to a Bronchoscopy Challenge along with 14 other doctors from the top institutions in the country. 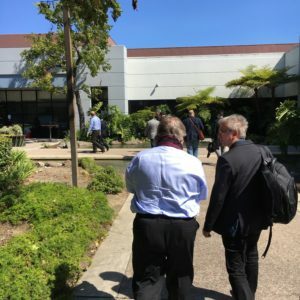 We all took a bus down to the site and learned about some innovative technology that has a chance to change the way doctors in our field diagnose cancer. I was able to spend time with Dr. Kyle Hogarth and Dr. David Wilson, both responsible for many advances in our field, and both whom have become good friends. I had a good showing and will always continue to attempt to get better and learn from the best. Item 3, check. Photo showing the docs walking into the challenge. Finally, back to Bay to Breakers. What a unique event. I was meeting with a company at 8am and out the window were thousands of people running in costumes, and some even with no clothes at all. 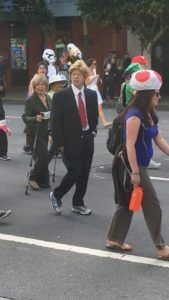 I don’t know why, but this guy in the Trump costume made me laugh. What a great weekend, and I’m already looking forward to next year. Thanks to all who are joining the movement, I’m excited to share the journey! Professionally, I am the City Forester in Aspen, CO. By City Forester, basically I mean I take care of the trees in town. I’m a pretty lucky guy to take care of the trees in Aspen. I really do enjoy my job and surprisingly, I have missed very little work because of this whole lung cancer thing. The treatments I have been on are targeted therapy drugs and they seem to be working pretty well (I should tell you that I have the ALK mutation and the drugs they have to treat this mutation come with few side affects). So, getting up and going to work every day is an opportunity that I have enjoyed and an opportunity I do not take for granted. Side note, this is one of the ways I hope that I am being a productive member of society – I get up, I go to work. The thing is, these drugs only work for a certain amount of time. The cancer slowly recedes and then the cancer slowly creeps back. But how long does it take to become resistant? It’s a waiting game and it’s different for each of us. I wake-up every morning and do a self-check. I ask myself – “is it harder to breathe? Am I short of breath? Is that itching in the back of my throat a cough? Is that subtle cough just a frog in my throat? Does my chest hurt?” and the list goes on. I don’t have it written down, I’ve memorized it. This waiting doesn’t overwhelm me; its just there and I know that soon there will be treatments to deal with the resistance issue. So for now, I’ll hope and wait. Tomorrow I will wake-up and do my self-check. I will feed Reina (my brown dog), drink some coffee and make a smoothie. I will get in my truck and make the morning commute into Aspen where I will spend the day caring for trees. It’s business as usual. Hi – My name is Ben. I’d like to share my story with you. First, here’s a picture. I want you to have some context. That pretty girl taking the picture is Katie and she’s my girlfriend. We hiked up to Grey Rock, just outside of Ft. Collins, CO recently. What a beautiful hike! 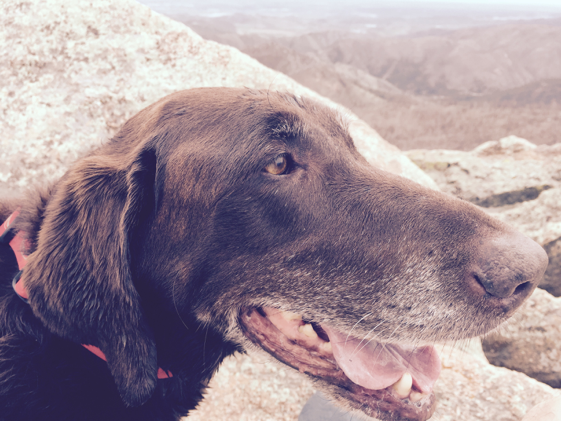 And how thankful I was for that day, spending time with my best friend and my favorite brown dog, Reina. Here is where my story will start. First, though, you should know where I have come from. Two years ago, I got a cold. The cold ran its course, except for a dry non-productive cough, and it persisted. 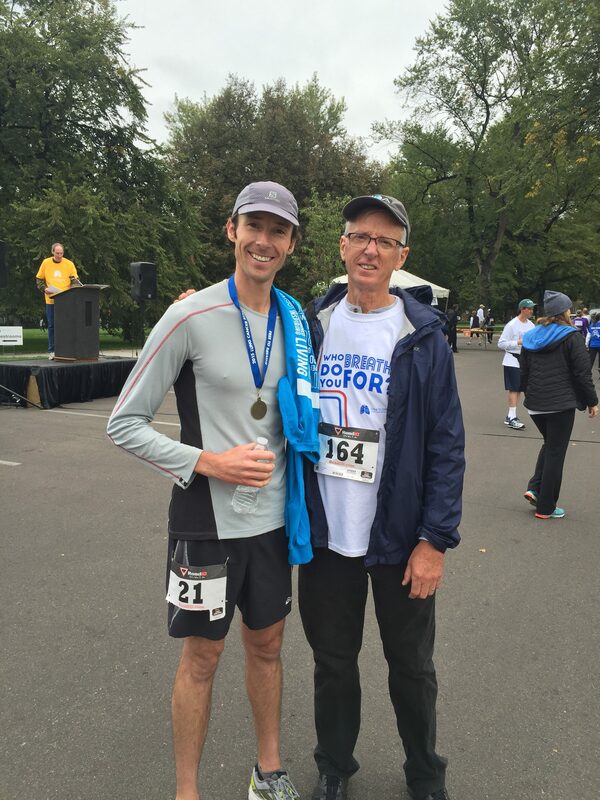 A trip to the family practice doctor ended up in a trip to the hospital for a CT scan, then an ENB procedure (fancy bronchoscopy) and finally to a lung cancer diagnosis by a doctor that would eventually become my “running buddy” (I think that’s code for friend). Looking back, I guess there were signs – being a little out of breath while walking up a hill or a little out of breath at the start of a run. I’m not a smoker though and I thought I was just out of shape – my family practice doctor would probably say, “…that’s reasonable”. So, I exercised more. I skied the Grand Traverse, a 38-mile ski tour through the mountains from Crested Butte, CO to Aspen, CO. I ran the Aspen Backcountry Marathon, a 26-mile run on a single-track trail up, and down the mountains, reaching elevations of 11,500 feet. None of this would keep the disease I didn’t even realize I had, at bay. Now back to the present. It has been two years since diagnosis. I’m on my second targeted therapy drug, Lorlatinib, (Crizotinib was the first). This past summer I ran the Aspen Backcountry Marathon again and the New York Marathon, both as a stage-4 lung cancer patient – other people like to say survivor. I enjoy moments like never before, and that day on Grey Rock was a wonderful keeper. Every patient is special, but not every patient can catalyze a movement. Like many physicians, I became a doctor so I could make a difference, to do something to make the world a better place. My dad always told me “pick a profession that leaves you both financially secure and personally satisfied.” And as I wrapped up my busy residency program in Vegas, and headed to the Rocky Mountains to begin a career outside Aspen, I was optimistic I had chosen both. Within a couple of months at my new hospital, I realized I had a knack for pulmonary nodule management, and began to build a practice around what would later become a leading lung center in the region. And because of this, a then 36-year-old patient was referred to me with several suspicious lung nodules. After review, I quickly got him in for a bronch, and diagnosed Stage IV lung cancer. I’ll never forget that day – that feeling that I had somehow let this young man down. It shook me to my core. Sure I had diagnosed lung cancer before. Sure many of my patients had been young. And yes, as a physician, death was a constant reminder of how vulnerable life can be. But there was something different about this diagnosis, about this patient. Maybe it was his constant optimism, his easy smile, and his warm heart. Or the way his parents immediately came to his side showcasing a strong Carlsen family unit, much like the one I had grown up in. Whatever it was, I couldn’t let Ben die. We all know the dismal stats…more people die of lung cancer each year than breast, prostate, and colon cancer combined… lung cancer is almost always diagnosed late… and more than half of all patients diagnosed with lung cancer die within a year of diagnosis. As a profession, we have failed. And while targeted therapies and advanced procedures are prolonging the lives of lung cancer patients, it’s not enough. That day changed the entire trajectory of my career, and today I’m on a mission to eradicate lung cancer. Through some blood, much sweat, and a whole lot of tears, I began my research, which today is known as The Nodule Project. The Nodule Project’s entire mission is to catch more Ben’s, and to catch them sooner. My hope is that you will embark on this movement with me, The Nodule Project, and together work towards lung cancer survivorship.